They should have retired decades ago but work harder than ever though well past their prime. The locals call them Diablos Rojos (Red Devils) and for good reason. They roar through the streets of Panama City with no mercy for pedestrians or the standing room only passengers who rely on them. This is where school buses are sent from the U.S.A. after they are given a pink slip. 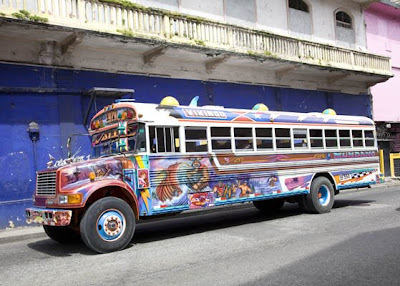 Like the Chicken Buses of Guatemala, which are also converted big yellows, they are decorated in elaborately painted murals. Diablos Rojos are street art on wheels. Each is staffed by an assistant to the bus driver like the one you see grinning in the photo above. His job is to shout out directions. Passengers are told to hurry up and jump in or off as the bus slows to a crawl but does not necessarily come to a full stop. 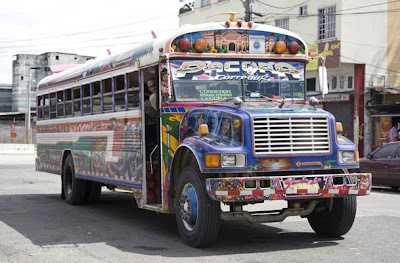 Buses rule the road recklessly and are the main mode of public transportation for most people in Panama City despite its roads being choked with cars during rush hour. Hi Wendy...nice to see the first posting from panama...how are you enjoying the city??? i am going to visit a friend in panama soon, it looks so nice! Good to have a chance to read about it first! I love to see the many ways that art is incorporated into life. I think these buses are beautiful, even if they aren't all that safe. This kind of reminds me of the colourful jeepneys of the Philippines!! Catherine, was a good trip. Kristine, Where will you be in Panama? Flygirl, I think they are beautiful also. I spent quite a bit of time on street corners trying to capture them. Jen, I would love to see photos of those. Lakshmi, My husband said the same thing!